Just like stepping into a time warp. Transported back into the late 70’s? Had enough of Indulgence? 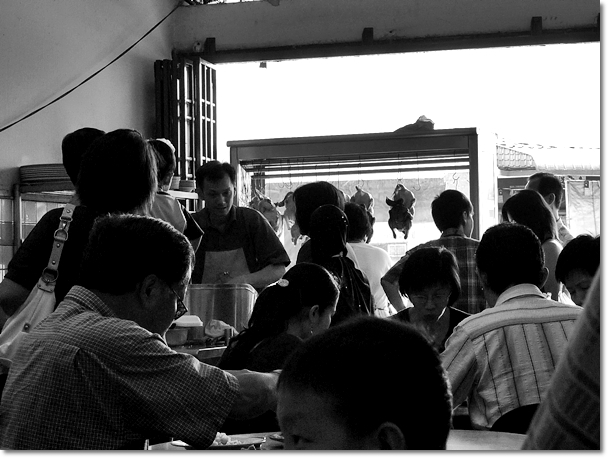 Okay, here’s a short post on Hainan Chicken Rice in Ipoh. As awkward as this may sound, I believe this is my FIRST post on chicken rice in Ipoh. This, albeit the fact that Ipoh’s famous for “Nga Choy Kai” (Bean Sprouts Chicken), and there are actually more than a handful of good and popular chicken rice outlets in Ipoh. On one hand we have the famous Rasa Sayang and Pak Gong on Jalan Theatre in town, next to the famous Eastern Wine. Then a short hop and skip away, you will find the double shoplots named Hainan Chicken Rice near to the perennial starlet of a stall serving Buntong beef noodles named Kedai Makanan dan Minuman Sri Maju. 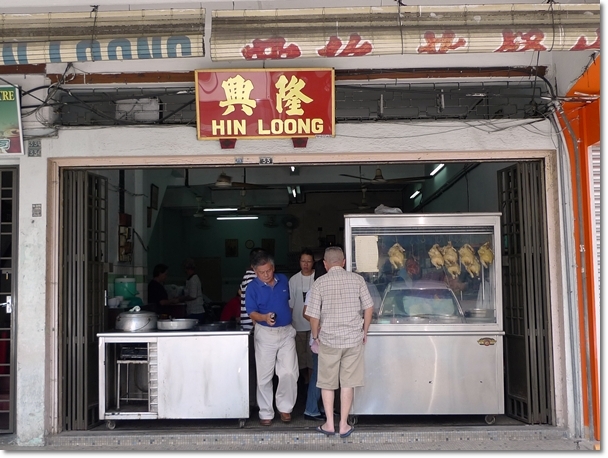 So how come I have never heard of Hin Loong Hainan Chicken Rice, until DT mentioned about this place over at the All About Ipoh page? And you’re thinking that Motormouth is the end-all, be-all of an Ipoh food expert? How wrong could you be? People; here we go again …. I am but a one-man show. I can’t be anywhere and everywhere at the same time, eating and writing about every single new outlet out there, can I? Even if I sometimes had this wishful thinking that maybe (just maybe) I can do the impossible; successfully writing about all the eateries in Ipoh. Then what? Do I stop blogging and move on with life? Change to a travel blog? (Sounds kind of inviting, if you ask me) Or perhaps continue to write on food from the other states in Malaysia? Fluffy grains of oiled rice separated from the clumps, with a faint yet distinctive hint of chicken drippings used to cook the rice till they attain that aromatic whiff. Just like how GOOD Hainan chicken rice should be. Pardon the incoherent rants, but there is always a reason behind every action. And forgive Motormouth for being slightly philosophical today; for these would be the trying times in life. And one of the most important yardstick used to measure the quality of the Hainan Chicken Rice experience is the Garlic Chili Sauce. Hin Loong has been around for at least three decades now. Currently run by the second generation in the family, the restaurant (okay, more like an “eating shop”, as they used to call restaurants back then) still attracts a constantly returning crowd during lunch hours, being situated in the prime location of Jalan Ali Pitchay; within the banking hub of Yang Kalsom road and vicinity. They are only opened for lunch, for a good 4 hours or so. Before selling out all of the chickens for the day. Usually closed by 3pm or prior, it’s advisable to reach here before 2pm. 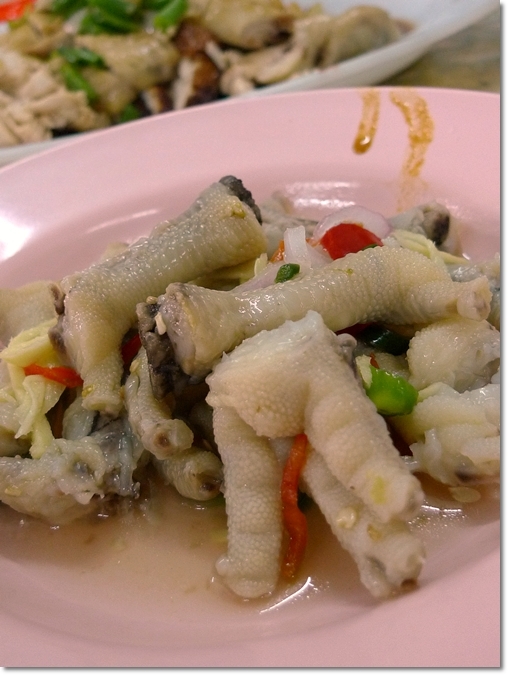 Unless you don’t mind picking on the innards, chicken feet, neck and such. IF …. they still have them. I wouldn’t say this is the BEST chicken rice in Ipoh. Don’t get me wrong, the authenticity of the Hainan Chicken Rice experience was definitely there. The poached and roasted chicken (you can take half portion of each, so you can sample the best of both worlds) served in a simple base of soy sauce and maybe a dash of sesame oil, garnished with roughly chopped scallions. But compared to the conventional Nga Choy Kai outlets (Cowan Street, Lou Wong, Onn Kee, etc), the chicken tasted like diamonds in the rough. A firmer, dense and cooked texture; not as slippery smooth nor tender but with a toothsome bite. The type of poached chicken you usually associate with home cooking, when grandma would steam/poach the fowls during festivities, and you’re not expected to see bloody bone marrows or translucent pink flesh. 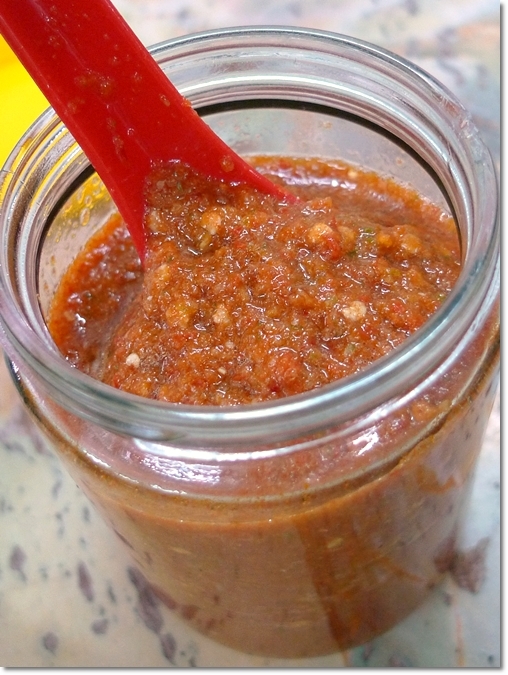 The chili sauce was good, just like how chicken rice’s chili sauce should be. Robust with a fiery kick, from mashed ginger and red chillies blended to a pulp. The side dishes were there to complete the meal. 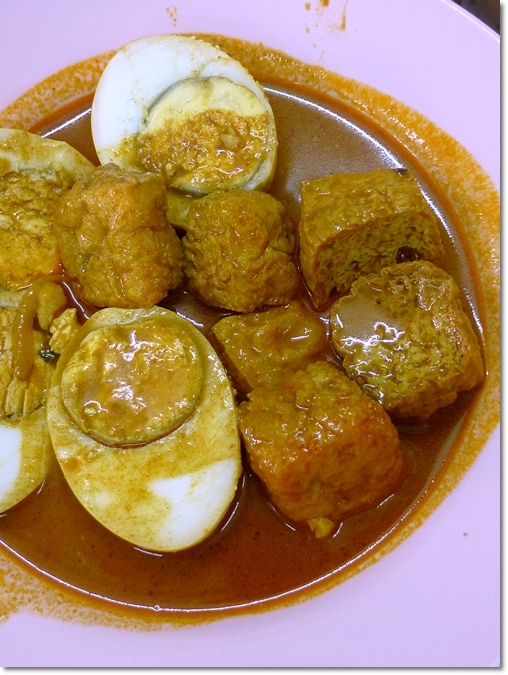 You can have their signature curried beancurd and eggs with a heavy curry powder taste (Chinese style of curries tend to taste this way), or the unusual serving of Thai style chicken feet but with bony bits. 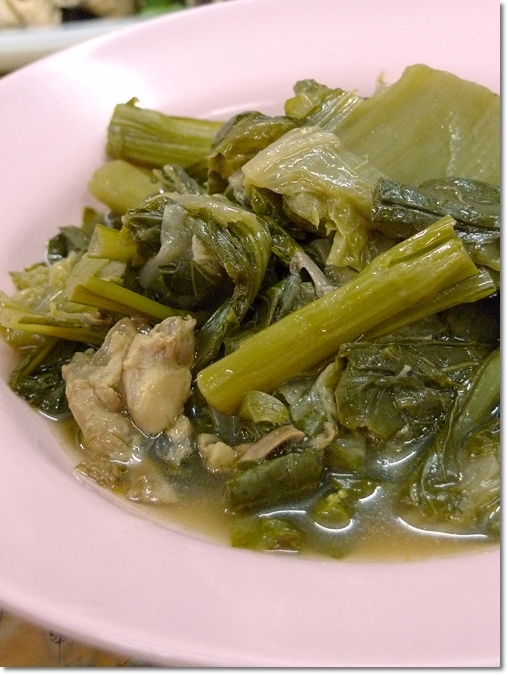 The sour vegetables, or mustard leaves cooked in a piquant assam broth (but this one without the dried chillies) tasted mild enough for children or the elderly. Everyone’s tucking in with eagerness. Ipohans really love their chicken rice huh? And just recently there was this tweet asking for good chicken rice in Ipoh, retweeted by Eating Asia. I could not come up with a great array of suggestions, for I don’t even buy the fact that Rasa Sayang or Pak Gong serves authentic and delicious chicken rice. 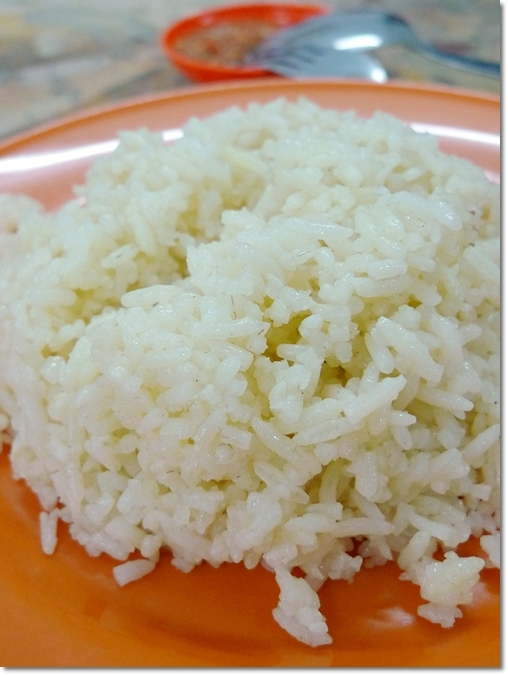 Maybe I am a picky eater, but I still crave for a worthy chicken rice in Ipoh …. Anyone? The meal for five came to RM38.50/USD12.40 inclusive of drinks. i still like pak gong chicken rice. there’s one nice chicken rice stall at Wah Lam coffee shop (opposite central, near foh san) but it has closed down. now the spot is also taken by another chicken rice seller but not nice as the previous owner. Yeah! That’s Seong Kee (I think written as Cheong Kee). They serve very good Char Siew too. You can find them in Bercham now. Oh, but there IS an individual chicken rice shop, opened next to Wah Pan. Supposedly from Hua Nam back then. Maybe that’s the one? 1st generation?! Oh …. maybe some years back huh? Wasted. That would have initiated a mass exodus to that stall back then, since most in my family like chicken rice. Maybe the Hainanese blood in us? the chicken rice looks good to me..makes me crave for chicken rice now! (heck and i wont get to eat it coz i work in a very malay office area 🙁 ). ewww on the curry powdered taupoks! There is actually a rather good Halal version of Ipoh Hainan Chicken Rice, with two outlets now in Ipoh. 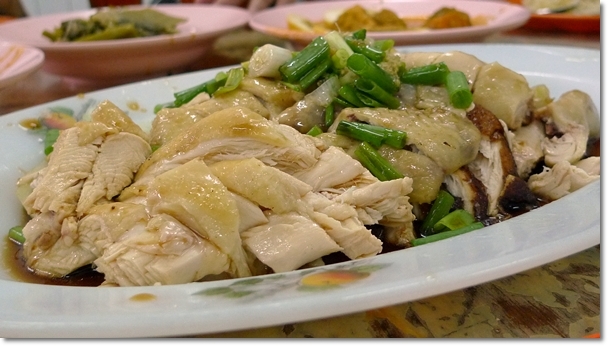 Very very Chinese-like chicken rice, with poached or roasted chicken, and other dishes. Just that the service leaves less to the imagination. The dishes look real nice except for the chix feed. Love the chilli too!! Hey, I need your support. Chk out this cool item, vote for me & win yourself a prize too. Details @ Be The One To Win A Mysterious Prize! Erm, you mean the one named Kah Seng Tauge Ayam or something? Yeah, that place used to serve our favourite nga choy kai too, back when Lou Wong, Onn Kee and Cowan Street were not still so famous like now. I’m not sure what is it called, but serves hainanese chicken rice! 😀 It’s at the corner, beside a furniture shop.